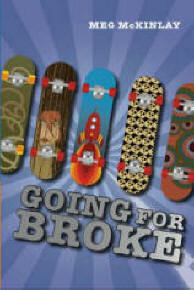 Going for Broke will be released in May this year as part of Walker Books’ new Lightning Strikes series. The series will kick off with six books and I’ll be in the fine company of authors such as Robyn Opie and James Roy. I have a feeling this is going to be fun! Sadly, we have had to lose the subtitle “One World Record, Fifty-Two Tiny Bones”, but I suspected that would happen at some point. This entry was posted in Going for Broke, Lightning Strikes and tagged covers, shiny new book on January 4, 2008 by Meg McKinlay.